The Decider Man’s presidential powers increased today, to double-super-duper presidential powers. We’re very sad today. 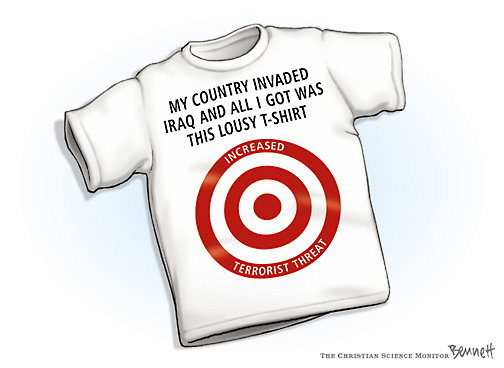 We’re sad for Iraq too, now that we know how much they want us out. Probably the soldiers will be handing out those t-shirts as they retreat, in exchange for the flowers and candies we got on arrival. Best not to visit the US until the Supreme Court strikes down our legalized torture and indefinite incarceration legislation. I hope the Decider Man continues his adventures. Soz, I wasn’t considering travelling to the US until DC is scrubbed of the stench of King Decider Man and the Imperialists… which makes a fine garage band name, doesn’t it? Isn’t Russell Crowe’s garage band currently nameless? Maybe there’s a suggestion box somewhere. Here’s a piece of good news from the Kingdom of GWB – public polls indicate for the FIRST TIME that W’s favorability equals his job approval. This means we now understand that the man and the job are the same. I’d link to the poll but I’m afraid of HTML.